Licensing is a procedure for recognizing the capacity of a higher education institution of a certain type at a state level to carry out educational activities related to the provision of higher education and qualifications in accordance with the requirements of higher education standards, as well as state requirements for staff, scientific, methodological, and logistical software. Accreditation of a higher educational institution is a state recognition of its status (accreditation level). By the decision of the Accreditation Commission dated November 25, 2014, Minutes №113, Vasyl’ Stus Donetsk National University was once again recognized as a higher educational institution of the fourth level of accreditation. 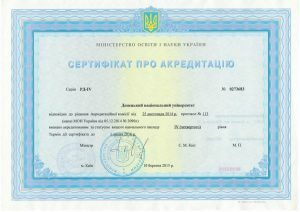 Accreditation of a direction, specialty in an educational institution at a certain educational-qualification level is a state recognition of the compliance of the level of training (retraining) of specialists to state requirements to the direction of training, specialty and higher education institution approved by the Ministry of Education and Science of Ukraine.